It is officially the end of Pancreatic Cancer Awareness Month 2017 and – thanks to all of you – it has been the best one yet! 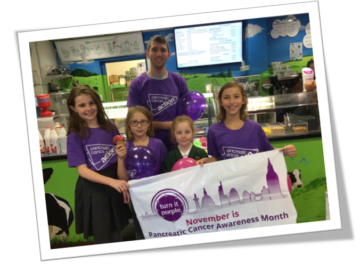 As well as it being all hands on deck in the Pancreatic Cancer Action office we have seen lots of amazing awareness initiatives taking place all over the country. 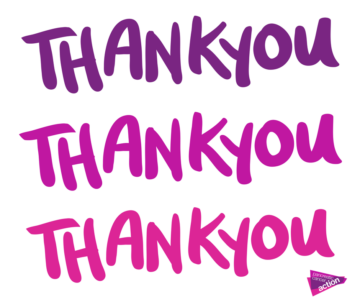 We would like to say a HUGE thank you to all those who have made November 2017 the most successful Pancreatic Cancer Awareness Month in the UK so far. We have had some incredible national media coverage over the month including our symptoms song in The Express, The Huffington Post featured our CEO, Ali Stunt, The Daily Mail shared our symptoms of pancreatic cancer and one of our amazing supporters, Anthony Smith, was raising awareness in The Sun. Many our lovely supporters have also been sharing their story within their local press media and our lovely regional representative for Grimsby, Becky Wright, won the ‘Fundraiser of the Year 2017’ award at the Grimsby Compass Community Awards! We have been particularly thrilled to see so many companies and pharmacies embracing the Turn It Purple campaign this year and have loved seeing all the brilliant photos of people having fun in the workplace! 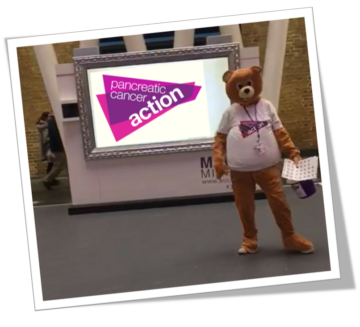 Whats more, on World Pancreatic Cancer Day Ali Stunt, along with dozens of our amazing patients and supporters have took part in numerous TV and radio interviews. We have had a record number of people take part in our Turn It Purple campaign this year with over 500 orders of Turn It Purple packs! Individuals and organisations all over the UK have been wearing purple at school and in the office, planting purple pansies, holding awareness stands, sharing social media posts and making purple decorations. This year we also launched our Turn It Purple Coverphoto competition. The engagement in the competition was fantastic – the photo gallery had almost 25,000 visits and 5,000 votes raising a huge amount of awareness! The winner of the competition, with 878 votes, is Jo Bowen with her ‘flying high for Pancreatic Cancer Action’ skydive photo! You can view the picture by clicking here. We are truly grateful to everyone who has taken part in Turn It Purple this year – thank you! To see photos of all the brilliant things people have been doing – and for inspiration for next year – check out the album on our Turn It Purple Facebook Page or click here. Lighting up iconic landmarks, communities and homes across the UK purple in honour of the thousands of individuals and families affected by pancreatic cancer is a beautiful way to raise awareness. 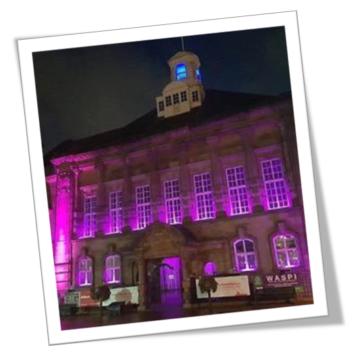 This year we were thrilled to have almost 90 light ups on the Purple Lights Map – Thank you so much to everybody for making this happen you are all truly amazing! If you would like to see some photos of buildings and landmarks that lit up during November, you can check them out here. If you haven’t shared your photos with us yet, we would love to see them! You can share them with us on social media using #PurpleLightsUK. You can also email your images to [email protected] and we’ll post them on the website. 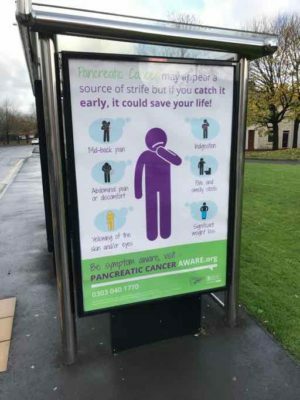 The rationale behind our Pancreatic Cancer Aware campaign is that while there is no early detection test, the key to improving survival rates is getting more patients diagnosed early by helping the public, and healthcare professionals, to spot the signs and symptoms of pancreatic cancer at the earliest stage. Pancreatic cancer has the worst survival rate of the 21 most common cancers in the UK, yet shockingly, 95% of the UK public know little to nothing about the disease. We launched a new symptoms song and animation as part of our national Pancreatic Cancer Aware campaign. The song is a light-hearted way to raise awareness of pancreatic cancer symptoms and drive home a serious message: ‘pancreatic cancer may appear a source of strife, but if you catch it early, you could save your life’. We are delighted that our patron, Nick Hewer, presented our BBC Radio 4 Appeal. 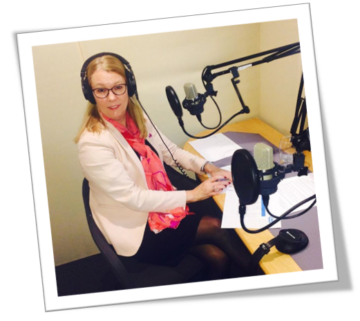 The appeal was broadcast on Sunday 12th November and Thursday the 16th November. So far the appeal has raised over £27,000 and a lot of vital awareness of the disease so that we can continue our mission to improve survival rates. To mark the start of parliament week we hosted a parliamentary drop-in session with Nic Dakin MP. Parliamentary drop-in sessions are an opportunity for Members’ of the House of Commons and House of Lords to come and find out more about the issues surrounding pancreatic cancer. The session was well attended by MPs, some of whom knew very little about pancreatic cancer. We took the opportunity to give MPs information about the recommendations from our round table inquiry; Hope for the future: tackling inequalities in pancreatic cancer care. Read more here. On 15th November 2017, we attended the All Party Parliamentary Group on Pancreatic Cancer meeting for the launch of a report calling on the Department of Health to take action to improve early diagnosis of pancreatic cancer. As you can see this November has been very busy! We have raised a huge amount of awareness of pancreatic cancer – which is key to improving survival rates of the disease. Thank you to everyone for their hard work this month, we really appreciate your dedication to raising awareness and funds to drive change for current and future pancreatic cancer patients. November is a time when we have the most voice speaking out about pancreatic cancer but raising awareness is important all year long and there are lots of way you can get involved. Whether it is taking part in a challenge, holding your own fundraising event or awareness stand, sharing your story or sharing social media posts, everything helps our mission of saving lives through early diagnosis.